European Blackjack is a very popular card game among the blackjack enthusiast. It's a closely related variant of a basic blackjack card game played all over the world. 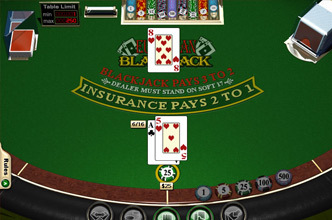 The European Blackjack possesses the similar rules and strategy features. The basic mechanism of the game presents a mirror image of the regular blackjack card game as well. So you may perform the European Blackjack live (either against casino or tournament variation) or online with ease. 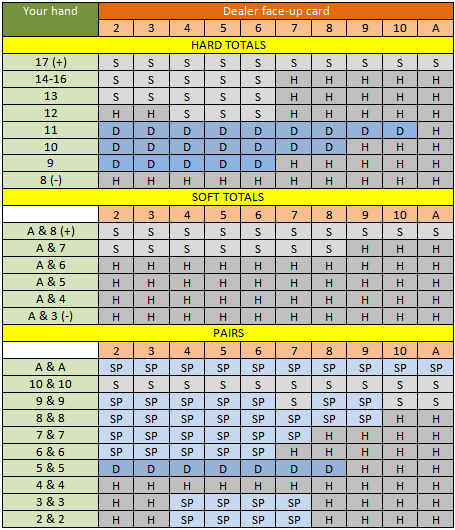 Let's have a good look at the European Blackjack specific features and basic strategy tables. 0.39% is a house advantage rate. Use the European Blackjack strategy tables given below and win more money performing blackjack live or at the online casinos. Practice your blackjack strategy skills persistently before you decide to start playing tournament blackjack. You just match the total of your hand (first green column) with the dealer face-up card (light-orange row) and get your recommended answer. E.g. your total (let it be hard) is 12 and the dealer hole card is 6 then the table recommends us to split (consult the tables given above).